Enjoy the luxuries of resort style living in this third floor contemporary unit with golf course views! Beautiful unit with breathtaking views. Elegantly furnished with comfortable furniture throughout the unit. King size bed, flat screen TV and walk-in closet in master bedroom. Queen sized bed in guest bedroom. Endless views of golf course from the extremely comfortable lanai. Full membership transfer with low fee of $200.00 will let you enjoy a 27 holes of championship golf (cart rental fees are the only thing you pay), 8 hard-tru lighted tennis courts, heated resort style pools & spa, fitness center, fishing dock, two restaurants, bars and more. The large pool is beautiful with tiki bar open every day and excellent food! Great location close to downtown Bradenton, I-75, Lakewood Ranch. 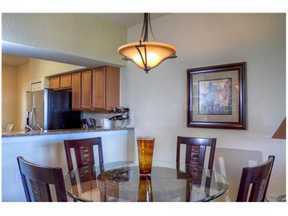 Short distance to Downtown Sarasota, beaches and everything that life in this paradise offers. No Pets allowed. Sarasota, Bradenton, River Strand, vacations, seasonal rentals. Owner will do a short term or long term rental of this unit. This will not last long! !